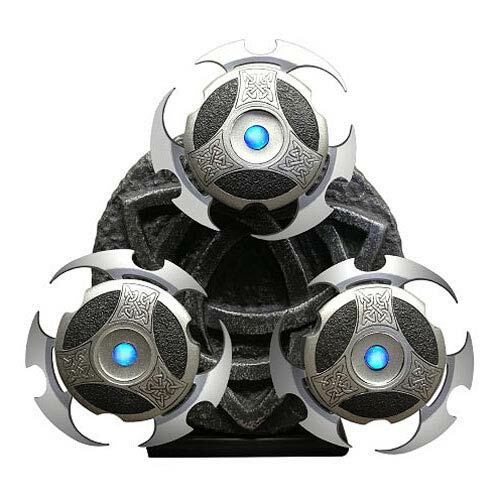 View cart “Underworld Selene Light-Up Throwing Stars Prop Replica Set” has been added to your cart. The Death Dealer’s weapons! Includes 3 throwing stars that light-up independently! Each polystone star measures 4 1/2-inches in diameter. Limited edition of 750 pieces! Collect the Death Dealer Selene’s unique weapons from the Underworld movies! The Underworld Selene Light-Up Throwing Stars Prop Replica Set was molded directly from the original screen-used prop, with each of the 3 hand-painted polystone stars measuring 4 1/2-inches in diameter. Each star has an intricate Vampire Glyph pattern with internal LEDs that can be independently illuminated with a blue light-up center just like the ones from the movies! The Underworld Selene Light-Up Throwing Stars Prop Replica Set includes an Underworld -themed display base that can either be wall-mounted or displayed on a tabletop. With the stand, the set measures 10 1/2-inches tall. Limited edition of 750 pieces.